The total number of arrests by U.S. Immigration and Customs Enforcement has risen under President Donald Trump, new data reveal, but the numbers have now plateaued, reaching levels below or in line with much of the Obama administration. 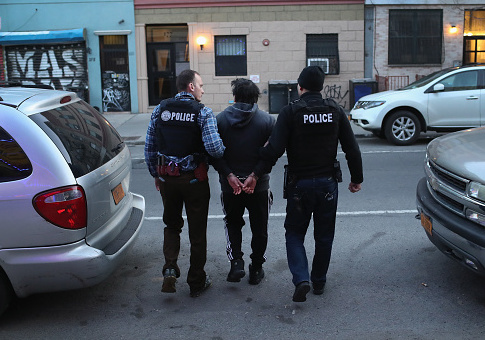 "Current ICE arrests remain only half the levels of five years ago," noted the Transactional Records Access Clearinghouse, a Syracuse University-based center which published the arrest information. Throughout most of its existence, ICE arrested suspected illegal immigrants under the set of priorities called the Secure Communities Program, a broad-based mandate that instructed ICE to target for removal, "public safety and national security threats, those who have violated our nation's immigration laws, including those who have failed to comply with a final order of removal, and those who have engaged in fraud/willful misrepresentation in connection with official government matters." As part of a more general move towards leniency in his immigration policy, then-president Barack Obama suspended the Secure Communities Program in 2014, replacing it with the Priority Enforcement Program. Under PEP, ICE was instructed to primarily target convicted criminals, members of gangs, or threats to national security. This left a large swath of the illegally resident population outside of ICE's purview for immigration enforcement—a de facto amnesty for millions of people. Shortly after taking office, Trump issued an executive order undoing much of Obama's immigration legacy. As part of that order, he ended the PEP and reimplemented the SCP, re-expanding ICE's responsibilities. As a result, arrests by ICE rose, hitting 400 per day as of May 2017. However, the latest data from TRAC show the number of arrests has plateaued. 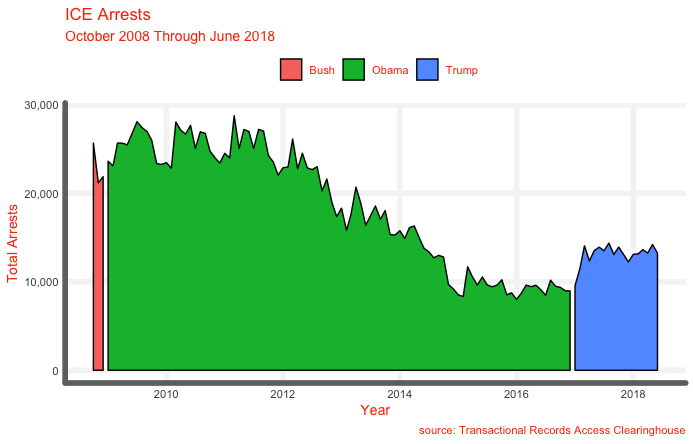 As of the most recently available month, the number of arrests is approximately at the level it was before the implementation of SCP, when the Obama administration ICE still used PEP. TRAC noted that while overall levels remain at levels similar to the Obama administration, under President Trump the proportion of "community" arrests has risen notably. The majority of ICE arrests are custodial, i.e., they involve ICE agents taking custody of an individual who has been detained by local, state, or federal law enforcement. Arrests under the 287(g) program, which allows partner state and local law enforcement offices to make arrests on ICE's behalf, have also risen. What this means practically is that while aggregate arrests have fallen, ICE has become more active, making more arrests on its own instead of simply relying on other law enforcement agencies to report suspected illegal immigrants they have detained. The reason why is not perfectly clear from the available data. ICE may be actively trying to take more of a hand in enforcement under a President who is more of an immigration hawk. Or, given the increasing non-compliance with federal immigration laws by "sanctuary" cities and states, ICE may be finding itself having to shoulder more of a burden than it has historically. What is apparent from the data is that the degree of attention received by ICE in recent months is not necessarily proportional to any increased activity under President Trump. Calls to "abolish ICE" have gained currency among the left-wing of the Democratic Party, including 2020 contenders Sens. Elizabeth Warren (Mass.) and Kirsten Gillibrand (N.Y.). House Democrats have introduced a bill to abolish ICE, although their proposal defers most of the details to a committee it sets up. While popular on the far-left wing of the party, ICE abolition has proved massively unpopular overall. Polls show as few as 25 percent of Democrats, and 25 percent of the overall population, support the idea. Voters likely do not perceive the still-relatively-suppressed activity of the organization, suggesting that a better understanding of the data might make abolition even more of a non-starter with the electorate. This entry was posted in Issues and tagged ICE, Illegal Immigration, Immigration, Trump Administration. Bookmark the permalink.